Ah, Las Vegas… The land where dreams come true. Admittedly when I think of Vegas my first thoughts are of slot machines, exotic clubs and empty bank accounts, cycling definitely wasn’t first on my mind. As Sheldon and I prepared for a mutual friend’s bachelor party however, it was something we thought we should look into. We knew that if we were actually going to make this happen it needed to be early in our itinerary, before our partying exploits got too out of control… Unfortunately, Vegas has a way of catching up with you. Despite scheduling the ride on our first morning and some time spent “purging the demons” from the night before, Sheldon pulled the plug and I was left on a solo mission to conquer Red Rocks. Thankfully my walk down the strip in full kit was done at 8:00am… The only other people were either people coming to start their shift, families getting an early start or ladies doing the ‘walk of shame’ in last nights party dresses – For all the ‘interesting’ people in Vegas, walking the strip in full kit will definitely get you a few stares. Mark (the guide) from Escape was great. He sympathized with Sheldon’s situation and indicated that it wasn’t the first time something like this had happened… The ride started about 40km outside of town at the Red Rock Canyon Scenic Loop. We got the bike fitted up, loaded with water and ready to roll. I bid my tour guide adieu and was on my way. The loop starts with about 8km of moderate climbing. I probably would have been more comfortable spinning it out on my compact crank, but didn’t really have too much trouble – other than the odd belch that allowed me to re-live the cocktails and McDonalds from the night prior ;-) The climb was a nice warm up and forced me to keep my pace in check and soak in the scenery. 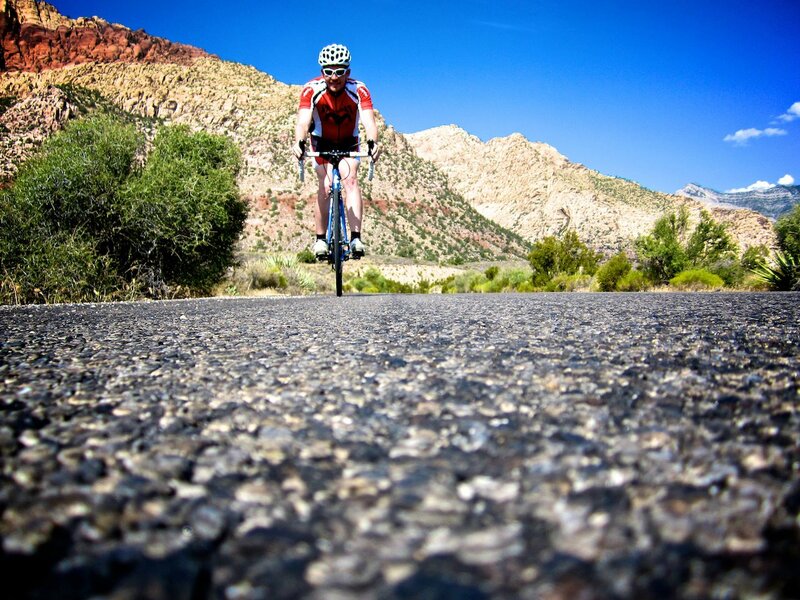 After the initial climb the real fun began – The roads… Oh, the roads. They were unlike any I’ve seen… Buttery smooth and completely devoid of any debris… Combine that with the fact that the road was one-way, capped at 35mph and it was a Tuesday – It felt like the course had been closed specifically for my delight. The few cars that I did see would even slow down and wave at me through the window… Where was I?!?! As I leisurely made my way around the loop I stopped at almost every scenic outpost to check things out… For an Alberta boy, the views of the desert and mountains were stellar – I was just out enjoying the ride and wasn’t in any real hurry. But the end of the loop ended up coming much too soon… I was just starting get a feel for things. After brief deliberation and restocking my water supplies at the info center I pointed my wheel uphill and decided to do it all over again. Talking to Mark when on the shuttle back to my hotel, he was mentioning the that mountain riding in Vegas is pretty good as well. Sheldon and I had opted out of this, because we weren’t looking for a guided tour, but that may be on the books should we return. 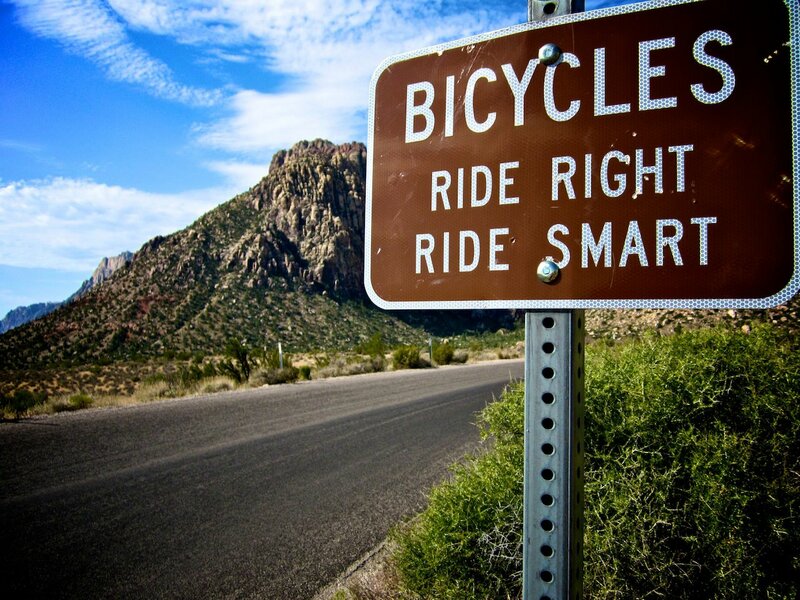 Vegas has a pretty strong cycling community so if you’re looking for a way to jump-start your season, or prolong it, I’d definitely recommend checking out the riding there. As far as blasting out 70k in the heat of summer? Though thoroughly enjoyable, you may stay away from this one unless you *really* like the heat. Awesome – Thanks for sharing Jody!